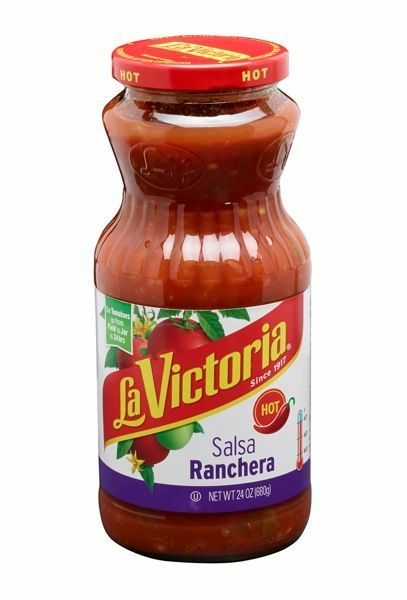 Salsa Ranchera La Victoria - Hot - 24 oz. La Victoria Salsa Ranchera Hot - 24 oz. A Jalapeno chile lovers salsa! Salsa Ranchera is an excellent garnish for those who like it HOT.Hot spicy, chunky red sauce with tomatoes, chiles, onions, garlic and cilantro. La Victoria Salsas. La Salsa Ranchera La Victoria es ideal para los amantes de la salsa con jalapenos. La salsa ranchera es excelente para acompanar cualquier platillo de la comida Mexicana autentica. Salsa roja muy picante con jitomates picados, chiles, cebolla, ajo y cilantro. 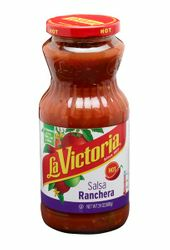 La Victoria Salsa Ranchera has been our household's go-to daily salsa for probably 15 - 20 years. While it may be too spicy for some, the flavor is excellent and complements many foods. the only negative is that it doesn't come in a large size. PUT ON EGGS, TACOS AND PORK CHOPS.....JUST THE RIGHT AMOUNT OF HEAT !!! I make a Mexican dip that calls for LaVictoria Salsa Ranchera-Hot! This item is not always available in my area. If I have to substitute another salsa for LaVictoria Ranchera, the dip is just not the same. This salsa is the BEST!